Mark Z. Danielewski first broke through with the literary horror novel House Of Leaves. A post-modern exercise in the idea that the placement of the words on the page could be as effective in storytelling as the story itself, the book was told in the voices of several different characters, in several seemingly different realities, as well as via footnotes that gradually took on a life of their own. It was a big, difficult book (Danielewski supervised its layout himself), yet it gained an intense cult audience, and the author has parlayed that into a successful career, garnering a National Book Award nomination for his follow-up, Only Revolutions, as well as a variety of other published work. His latest is The Fifty Year Sword. Published originally in Europe in the mid-2000s, the short book, another scary tale, is finally being released in the United States in an edition that’s been heavily reworked by Danielewski, based on his work adapting it to the stage and with sewing paper. 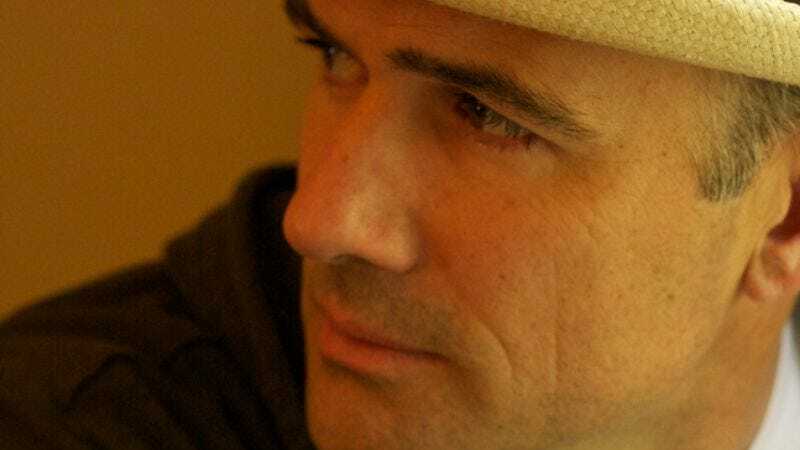 Danielewski sat down with The A.V. Club at San Diego Comic-Con to talk about why it took so long for the book to reach the U.S., why adapting House Of Leaves to the e-book format has softened him on a potential film or TV adaptation, and the importance of relationships to his work. The A.V. Club: It’s taken this book a while to come out in the U.S. What led to it coming out now? Mark Danielewski: I always thought it was going to come out a lot earlier. It just seemed a smaller book that was perfectly suited to come out at the moment it was conceived. But it’s not that simple a book. It’s complicated. It has a density that is easy to miss, gratefully. But in its execution, when I wanted to formalize the design, it became a lot more tricky to navigate. Initially, my publisher in Holland wanted to publish a short story, and I happened to just have created this thing, and they were going to do a little chapbook, and that was it. When they got it they said it was a little too long, and then they heard about the colored quotation marks and they said, “Why don’t we just do it as a book?” But Only Revolutions was coming out on Pantheon in 2006, and I didn’t want to have a second book that wasn’t really a second book competing at that moment with a book that I had just spent six years on. So they said, “We’ll do it just as a limited version, and we’ll only print 1,000 copies.” They ran it twice, so there were 2,000 total. So I said, “Okay, that sounds good. We’ll do it that way.” Then there was a wonderful Dutch artist I worked with, he provided the illustrations. I oversaw some of the design, but I wasn’t actually able to personally design everything because it was done overseas. I thought of it as sort of this little thing. For whatever reason, those sort of petered out. Then I kept coming back to it, so I put it on as a live show on Halloween night at REDCAT, at the Disney Center, and that was incredible, because it is an oral tale. It’s an oral story told about an oral story, and the consequences of malice and fate that were being orchestrated around these kids at a very early age. So suddenly, you have five actors stitch together all of these lines. It was very exciting, resonant. It had music. It had shadows. People seemed to have a great time. We did that for two years. We’re actually going to do it this year, the last year I’m going to do it. Two nights. Halloween. It’s going to be a lot of fun. As I eventually learned, when I got my own machine, you personalize these machines. They have quirks and they’re very delicate in some ways, and if you mistreat them or misalign them in some ways, they can suddenly misfunction. But, at that moment, I stitched some paper, and I thought, “This works.” So I started sewing paper. Then eventually, there were three people working on it full-time and we sewed endless butterflies and mountain scenes and flood scenes. And so for me it was again about how to literalize the thread in the story, but not break the thread so it becomes too much about an image. It’s all constant play between the thread of language, of meaning, playing off of the thread of image, of the language of image and the meaning of image. And that was an intense amount of work, but very gratifying. For me, it was, again, another exploration that has happened with all my books, of ultimately opening up to other influences, to have other people working on my book. Which is something that I wish to further expand with The Familiar, which will come out in a few years, which is a 27-volume novel about a 12 year-old girl who finds a cat. So again, like House Of Leaves, where there were people that helped early on, via online communities, Only Revolutions, a lot of those historical moments were brought about by people in online communities, this is, in some ways, shaped by the actors and the audience at the readings, because I did tailor some of the text. For the most part it’s there. But then as well, the experience, the interaction and whatnot. And finally these pieces of art, which finally make sense. They’re integral to the book and I’m very happy with the way they look. Whether people like it or not is irrelevant to me. It’s the colors, the threads, the shapes, the images works. And that’s very satisfying. AVC: The process of going into the design at the same time as your writing is an unusual one. Have you always written that way? MD: Maybe what’s unusual is that I pursued it, because I think we’ve all done it. On a certain level, when we were just drawing with crayons, we liked that certain words were in certain colors. The way education works these days, and certainly in the days when I was being educated, teachers told you that you had to use this font, and you had to write between the lines, and this is what was important. Things had to be regimented; they had to be routinized. They had to acquire a uniformity, and there’s some value in that. But I had always loved the way certain texts could evoke certain meanings. Part of that was that I grew up on films. I saw films all the time. My father was a filmmaker. We screened movies downstairs. We talked about them. We talked about the politics of image, the politics of angles and colors, how stories are shaped, all of that. For me, I was always aware of the vitality of the image of the page, and I’ve always loved illuminated text and graphic novels and comics. But I also loved the way newspapers looked, with advertising. Then, of course, web pages began to have a certain sense, and why certain things in advertising worked and were appealing, and why they didn’t. I think I was, like many people, infected by that visual profundity in our culture, but I just pursued it. AVC: Your books, obviously, have film as such an influence on them, but they seem unadaptable. Have you ever contemplated a film adaptation of something? MD: All the time. We get a lot of inquiries. A lot of offers. I was definitely more closed off to it early on. I’m maybe more open to it, but I don’t want to mislead anyone. One of the things that’s sort of shifting me, changing me, is turning House Of Leaves into an e-book. Because as much as it’s the same words, as much as it contains the language that is intimately familiar to me, it is an adaptation. “This film has been modified to fit your airline screen,” you know? In doing that, I realized, “Okay, maybe it’s the same as a movie in some ways.” Even though it seems closer, the labyrinth chapter is not going to look anything like the labyrinth chapter in the hardcover/paperback book. So then I begin to say, “Well, if I’m willing to do that, could I imagine this as a television series?” And the answer is “possibly.” But I have reservations. There are serious offers; there are people that are seriously interested in doing that, and maybe I’m looking for that chemistry. That sense that I had with the artwork in The 50 Year Sword, “This makes sense.” Maybe if that happens, I’ll go, “Okay,” but at this point, I haven’t had that experience. AVC: You’re really interested in putting relationships through a crucible within the course of your novels, even as your novels take apart fiction or the story in the same way. Where does that interest come from? MD: I think it’s what matters. What I was drawn to, as I was contemplating your question, was it’s all about language. What binds us together is language, whether it’s physical, touch, whether it is romantic, or whether it’s verbal, or whether it’s over electrical wires/optical cables. And how does that work? What does language contain? Some of that language we think of as our own, but it contains nuances and inferences and viruses, in a way, of relationships gone bad, of things that have failed. Yet we use these ancient molecules of sense to create bridges between each other, and sometimes they endure, and sometimes they don’t. I think the way the relationships live in my novel is the way I see most relationships. Even the closest relationships that I have I know could potentially fall away. That’s not to speak pessimistically or negatively about those relationships. In a weird way, it’s the opposite. I value them. It’s that we are able to overcome that kind of separation, that kind of distance and connect through strange sounds or squiggles on a screen or a piece of paper, is miraculous to me. I don’t need the miracle of a sea parting when I have at my hands the alchemical wonder that takes ink and electronic mists and creates a bond with someone. That’s fantastic. I’ll always explore that, because it’s something that I feel is intrinsic to who we are.